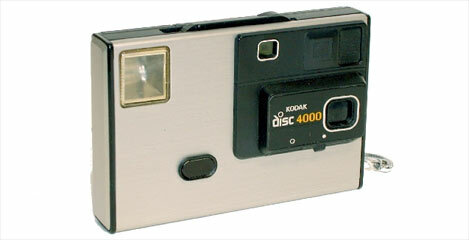 Kodak introduced their Disc format to the world in 1982. The film came as a flat disc, sealed into a plastic shell. Each disc captured 15 images measuring a puny 8 x 10mm -- too small to produce anything larger than a slightly grainy standard-size print. The format had two selling points: the cameras were incredibly thin, and loading film was an incredibly simple process. Unfortunately, the image size was just too small to allow decent quality, and the format disappeared from the market in 1989, although film discs remained available until the late 1990s. These days, they're just quirky paperweights.